I’ve always been fascinated by fire. A primitive magic, fire is supremely dangerous and yet supremely beautiful. Fireworks high in the sky on the Fourth of July, bonfires, candles, the mesmerizing tip of a burning match — all too beautiful for words. When I was in high school, sometimes the family would go down to our grandfather’s patch of land in Bosco, La., to help clear any accumulated large brush and tall weeds. My grandfather would cut down as many of the weeds as possible, pile the brush and weeds into a huge pile, and light it on fire. One time, all the grandkids thought he was burning some kind of wild marijuana, because the leaves sort of resembled the multi-fingered leaves we had seen in pictures, but not exactly. We ran in and out of the bonfire smoke trying to get a whiff of it here and there, and then drunk-walked and said goofy things to mimic how we thought being high would be like. In other words, we were just plain silly. What we didn’t know was that we were running around in the smoke of a large crop of giant ragweed. No wonder I can’t breath smoke today without triggering a full asthma attack. Despite the asthma, one of my favorite things to do with fire is toast marshmallows. I toast them on a low heat until the center is warm, gooey, and almost falling off the stick, then I flame the outside to create the burnt sugar brown-black crust. You have to keep rotating the marshmallow so that it won’t fall off. A half-toasted marshmallow falling into the fire is a sad sight indeed. Because the only summer camp I ever attended was band camp, I didn’t learn about smores until I was a little older. 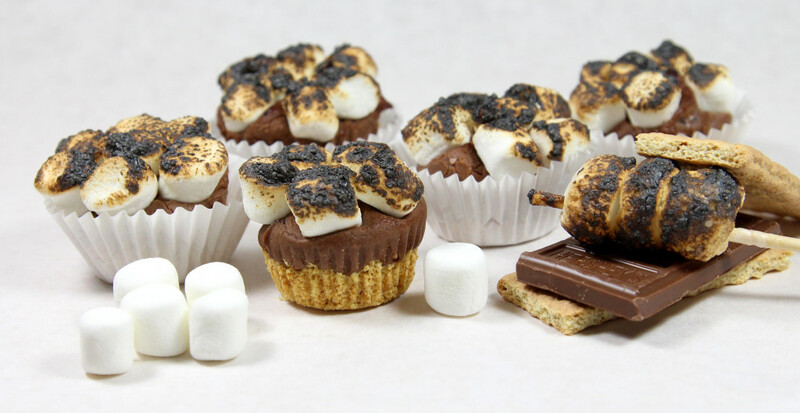 Hot, gooey marshmallows sandwiched between milk chocolate with a graham cracker crust? What could be better than that? 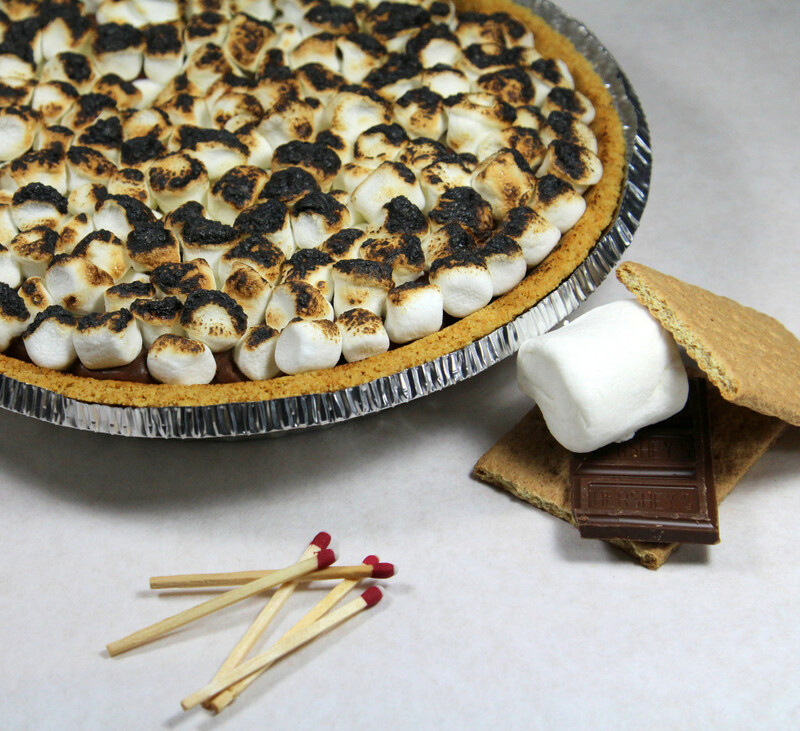 With that in mind, and because it’s the Fourth of July and you must have pie, I decided to give Smores Fudge Pie a try. I made two variations, one using a premade graham cracker pie crust and then a batch of individual smores fudge tartlets made using graham cracker crumbs. If you’re in a hurry, the pie version is the way to go. The tartlets take a little more effort. Heat sugar, butter, and milk over medium heat to a full, rolling boil in 3 qt. heavy sauce pan, stirring constantly. Boil on medium heat until the candy thermometer reaches 234 degrees F, stirring constantly. If you want the fudge to be a little less firm for the pie, you can probably back off to 230 or so. Stir until the mixture thickens and starts to look dull. Pour the hot fudge into the graham cracker pie crust. Cover the top with either minimarshmallows or regular marshmallows cut in half. Press the marshmallows about halfway into the fudge so that they stick when the fudge cools, in order to avoid flying flaming marshmallows during the toasting phase. Light the blow torch and toast the marshmallows. If you want gooey centers, start at some distance to warm up the marshmallows before you flame them. When you see flame-ups, use a hand-held battery-powered fan to blow them out, unless the people who eat the pie don’t mind your spit. Do NOT use compressed air, unless you really do want flying flaming marshmallows.